Looking for environmental remediation services for your home or business? Give Skyline DKI a call for fast, professional, and safe recovery services. Biohazard situations represent a major threat, and it’s important that any incident get taken care of quickly and effectively. Mold growth, sewer backups, former meth labs, and other biohazards can cause serious health problems for anyone living or working on the affected property. Fortunately, our licensed and certified environmental remediation specialists can safely eliminate the problem, so your property is healthy once more! If your property has been affected by a biohazard, it’s important to avoid the contaminated area. Give Skyline DKI a call 24/7/375, and our team will arrive quickly and begin the remediation process right away. No matter how extensive the damage, they will completely remove the threat by thoroughly cleaning and decontaminating the area! Q: Several members of my family have been getting sick a lot, but we’re not sure. Could it be our house making us sick? There is a possibility that some sort of contaminant in your home, such as black mold or untreated sewage backup, could be making your family members sick. Give Skyline a call, and our trained environmental remediation team will come and assess the situation. If something is wrong, they’ll work quickly to clean it up so your family is healthy again! Q: Can you take care of strong odors that don’t ever seem to go away? Yes. Our team has the most advanced deodorization equipment, and it will eliminate even the most stubborn and offensive of odors. Some odors are often the result of some sort of environmental problem, they can also inspect your home to see if the smell is caused by some sort of untreated problem. Q: A tenant was using my property as a meth lab, and the police officers told me that I needed to find a licensed meth lab cleaning company. Can you take care of it? Yes we can. 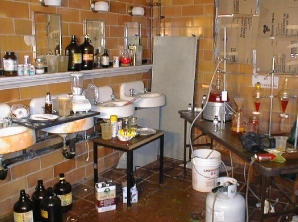 We have a well-trained and highly experienced team of certified meth lab clean-up specialists. Give us a call, and our team will get to work completely eliminating the chemical residues from your property. By the time they’re through, your property will be completely healthy.